Only 90 minutes by car from the Geneva airport, nestled at the base of the Swiss Alps in the quaint town of Les Cerniers, the Whitepod Eco hotel offers 15 stand-alone luxury pods bearing Buckminster Fuller’s design concepts, mingled with luxurious king beds, custom furniture and thoughtful amenities. An en-suite bathroom and shower complete each pod, making them neither grandiose nor pretentious; but simply charming. Fifteen pods, each with a deck overlooking the valley below, are a fifteen minute walk from the check in lobby. Not to worry, though. The thoughtful staff provides each guest with a backpack containing everything you’ll need to make the trek to your personal pod. Crampons, a necessity during winter months, are included as well as walking sticks, flashlights, maps and umbrellas. 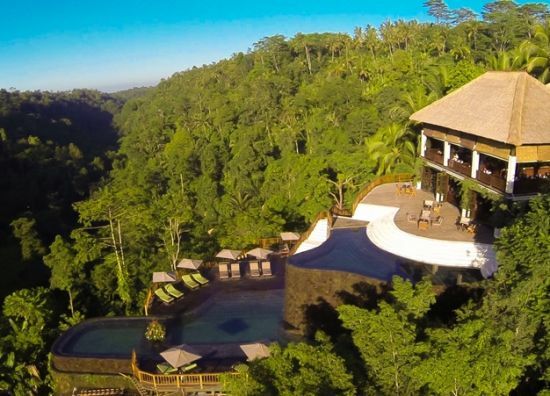 The magic of Bali, an Indonesian island with forested volcanic mountains, beaches and coral reefs, is home to the five-star Hanging Garden Resort cradled deep in the Indonesian rain forest. With 44 private suites spread over nearly eight acres, each guest villa boasts its own thatched alang alang thatched roof and a private granite infinity pool. Perched well above treetop level, the view takes in the Ayung River gorge with a view to the ancient Dalem Segara temple. If your own private pool seems to secluded, be sure to visit the stunning two-level infinity pool suspended high over the jungle so you’ll feel you’re swimming above the treetops. To experience the ultimate immersive rush that comes from being in the world’s most famed swimming pool, take time to enjoy the lower level and the waterfall that cascades upon you from the level above.